Drag left & right anywhere on the screen to move from side to side. Tap the screen to rotate the two cubes. Land one of the falling cubes onto an existing cube so that the digits on the two cubes add up to the AWEsum. When you're double AWEsum, your score multiplier increases, and you earn another Swap Sphere. Try to match the cubes colors as well. If it's impossible to be AWEsum with the given falling cubes, swipe a Swap Sphere toward them to generate new cubes. The lights at the bottom of the screen count the number of consecutive AWEsums you've made. The Expanding Arrows can be dropped in a gap to affect cubes horizontally, or rotated & used vertically to affect an entire column. The Number Bomb will affect all cubes of a given digit. Try to create gaps that are AWEsum! The color star will affect all cubes of a given color. It can help clear the board very quickly. 10 points per AWEsum plus 10 points for each color match plus 1 point per row power-dropped. 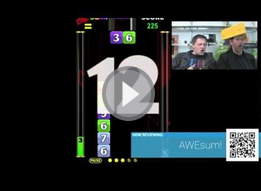 Base score multiplied by # of AWEsums in 1 move. All scoring multiplied by current level.